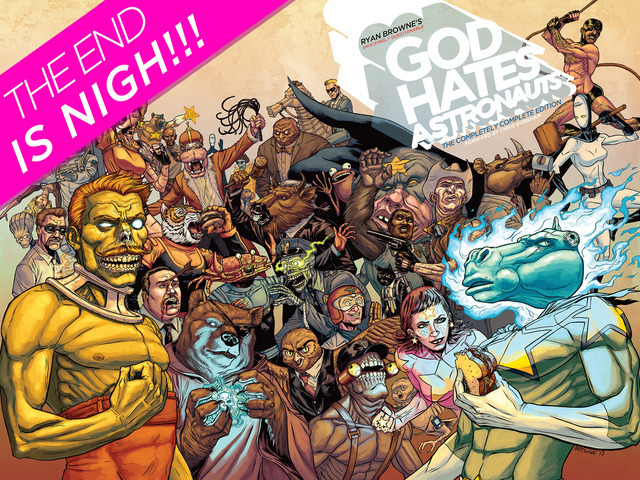 There is nothing resembling an easy way to describe God Hates Astronauts by Ryan Brown. But Image Comics gave it the old college try: “God Hates Astronauts follows the story of a group of incompetent, small-minded, super powered narcissists called ‘The Power Persons Five’ who are hired by NASA to stop all farmers from launching themselves into space in homemade rocket ships. Unfortunately for NASA, this goal is scarcely even addressed and the book focuses more on extramarital affairs, bank-robbing owls, big gross swollen heads, ghost cow heads, olde tyme boxers, tigers eating cheeseburgers in the Crab Nebula, buffalo judges, and tons of aggressive swearing. Not so much a superhero book as it is a parody of basically everything and a celebration of weird that is jam-packed with references to RoboCop and Die Hard.” Got all that? Oh they neglected to mention the army of magic bears, too. 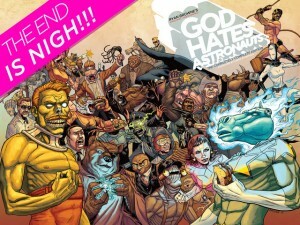 Image released the first God Hates Astronauts full-color trade paperback last year, and now they have a brand-new G.H.A. comic book series starting up this month. This is another book that I couldn't get a review copy of from the publisher.